Okay. So. Alternate history. I wasn’t sure about this. I’m a huge history buff. As I write this review, the History Channel is on in the background and they’re talking about the founding fathers. Not only do I love history, but Tudor history is a time that fascinates me. Every person had a part, even the women (even though they were severely underestimated) and the fact that a country and religion was turned upside down because of a few select people amazes me. Writing a rewrite of that history could either be one of the best things I’ve read or one of the worst. 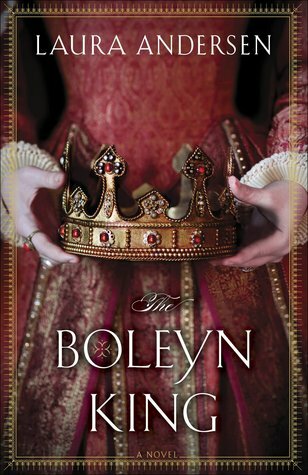 I am over the moon that The Boleyn King awed me. The way Anderson has crafted her story makes it feel as though this really could be the true history. She could have easily made the characters fit the better moral standards we have now, but it would not have felt authentic. The drama is there, both in the court and with France, and Anderson has done an extraordinary job of imagining how the past could have been dramatically different. With one change, so much potential was unleashed and Anderson took full advantage. The story is written mostly in 3rd person from four points of view; Minuette, Dominic, Elizabeth, and William. Minuette is an orphan born on the same day and William and grows up as a part of his and Elizabeth’s lives. She is fortunate and knows it, but never takes advantage. Dominic is the best friend of Will and always speaks his mind when others would lie to the king. William knows he needs that and trusts Dominic more than nearly everyone else in his household. Elizabeth is the dutiful princess wishing for something a little more free. She knows her role, but that doesn’t stop her from dreaming of having choices. These four have grown up together and their friendships create a fantastic story. I cared for every single one of them and the dynamic between all these characters unfolded wonderfully. Will and Elizabeth had their moments of being royal, and then a few pages later they are just people with their friends. Minuette and Dominic are able to speak more freely with the royals than most and that creates a special kind of tension and jealousy within the court. The Boleyn King drew me in on the first page and it only got better from there. It’s not hard to picture this as a history book instead of a fiction novel and that is what I love most about it. Anderson completely convinced me of this alternate history and waiting for the next book is going to be its own form of torture. Thank you to Random House Publishing Group – Ballantine and NetGalley for an advanced copy of the novel in exchange for an honest review. This entry was posted in Historical Fiction, The Must Reads and tagged Alternate History, Historical Fiction, Laura Andersen, Must-Reads, Seriously...You Must Read This.